Comment: Lush rose red unheated ruby in full size and rare shape. One inclusion only (1) and that is visible only under the lens and deep under cover, almost 'free of inclusions'. Excellent quality in untreated ruby, from new Mozambique mines. Big AIGS report with 'no treatment' and origin. Never dark, not even in lowest light but then actually blooming up in deep flowery glow, never pale (nor pink). Value buy at $11k/ct minus your member-discount. 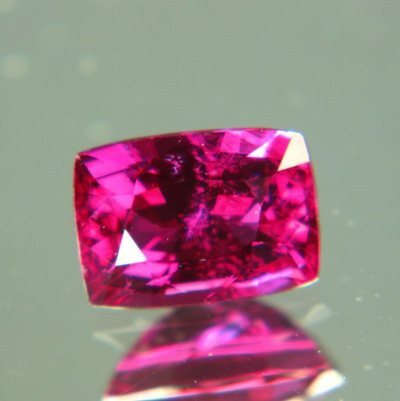 Rare clarity and fiery luster in 9x6mm unheated ruby with the WildFish-only quality standard: No treatments! No windows! No inclusions!